Newton (JH) M. Johnson, Jr. Provide comfort for the family of Newton (JH) Johnson, Jr. with a meaningful gesture of sympathy. 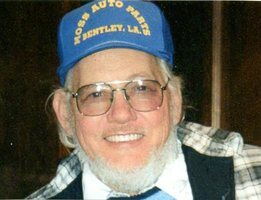 Mr. Newton M. Johnson, Jr. (JH), age 76, of Colfax, Louisiana, entered eternal rest on Saturday, March 16, 2019 at his residence. Memorial services for Mr. Johnson will be held on Tuesday, March 19, 2019; at the United Pentecostal Church of Dry Prong at 5:00 p.m. Friends may visit from 11:00 a.m. until time of service. JH retired from the DOTD and was a member of the Water board. He loved working, hunting and fishing, and socializing with those he loved. JH was a hard worker and was a character of his own. He will be greatly missed by all that knew and loved him. He was preceded in death by his wife of 53 years, Dorothy Johnson; parents, Newton and Leola Johnson; 7 sisters and 3 brothers. Survivors include his 3 daughters, Shelia Phillips of Dry Prong, Gwen Mason of Harrisonburg, and Lehoma Couch of Dry Prong; 3 grandchildren that he raised as his own; Jeffery Harvey of Colfax, Lisa Futrell of Colfax, Michelle Stewart of Dry Prong; in addition to 7 other grandchildren; 28 great-grandchildren; 1 great-great grandchild; 1 sister and 2 brothers. Friends may post online messages of condolence for the Johnson family by visiting www.gallagherfh.com. We encourage you to share your most beloved memories of Newton (JH) here, so that the family and other loved ones can always see it. You can upload cherished photographs, or share your favorite stories, and can even comment on those shared by others. Provide comfort for the family of Newton (JH) M. Johnson, Jr. by sending flowers.